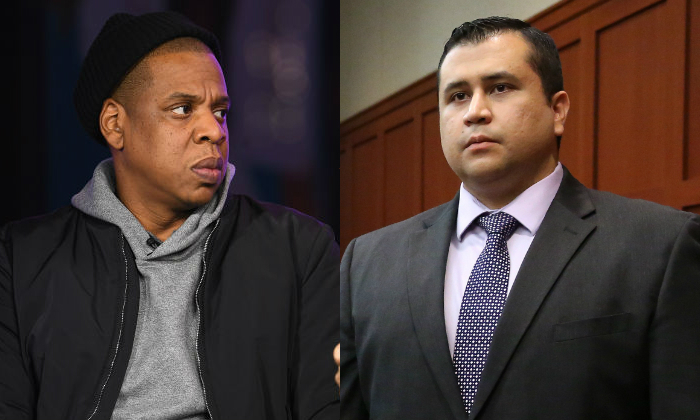 George Zimmerman said he would beat Jay-Z and feed him to an alligator after a production team for a Trayvon Martin documentary visited Zimmerman’s relatives unannounced. Zimmerman made the threat via The Blast. He said the production team is trying to coax interviews and video footage from his family. The Blast said that the executive producer for the six-episode docuseries, Michael Gasparro, brought a team to the homes of Zimmerman’s parents and uncle. “I know how to handle people who [expletive] with me, I have since February 2012,” said Zimmerman, referring to the incident with Trayvon Martin, via The Blast. Variety reported in March that Jay-Z and the Weinstein Company were collaborating on projects about Trayvon Martin, the teenager that Zimmerman shot while on neighborhood watch duty in Florida. Zimmerman said he was defending himself when Martin attacked him, The New York Times reported. He was acquitted of murder, which led to protests across the country. In interview with GQ in 2014, the Zimmerman family described how they have been on the run from the public since the incident. They feared people were going to attack them or attempt to kill them in revenge. Robert Zimmerman Sr. expressed that the pressure unhinged George and affected his mental state. The status of the movie’s production is unknown since Harvey Weinstein’s sexual allegations have emerged. Jay-Z signed a two-year deal with Weinstein’s company for TV and movie projects in 2016, Variety reported. That was before the Weinstein sexual controversy led to a movement that toppled the careers of numerous men in the entertainment industry and in politics. Jay-Z bases the documentary off the book “Suspicion Nation” by Lisa Bloom. In “Suspicion Nation” Bloom gives her view on why the Trayvon Martin case resulted in an acquittal. Bloom, a lawyer, was the focus of controversy after she chose to provide legal counsel to Weinstein to protect his image after the sexual allegations, Los Angeles Times reported. She later stepped down from that role, but she is back in the news again, accused of arranging abundant money, including media deals and six-figure compensation, for women who accuse President Trump of sexual misconduct, according to The Hill. The story talks about a woman who was continually offered increasing sums of money to slander the president even though she was a Trump supporter and continually declined the money.